USDA’s National Agricultural Statistics Service margin calculation for February indicates a second month of payouts for producers who enroll at the higher coverage levels allowed under the new Dairy Margin Coverage program. The prices used to determine the February 2019 margin under the Dairy Margin Coverage program, the new version of the previous Margin Protection Program for Dairy, generated a margin of $8.22 per cwt. That would not have produced a payment to any farmer under the old MPP, which had a $8/cwt. ceiling. Under the new DMC, that margin will generate a payment of $1.28 per cwt. for producers who purchase coverage for this year at the new maximum level of $9.50 per cwt. For example, a farmer insuring 5 million pounds of milk production history at the maximum $9.50 per cwt. is already guaranteed to receive $6,307 and $5,347, respectively, for the first two months of the year under the DMC as currently calculated. The February margin was $0.23 per cwt. higher than the margin in January, the result of a $0.20 higher milk price and a 3-cent lower feed cost. Together, margins from the first two months of 2019 are already enough to ensure that producers who enroll at the maximum coverage level will receive more in DMC payments during 2019 than they will pay in premiums. USDA, which has announced that signups for the 2019 program will begin by June 17, is predicting that DMC coverage at $9.50 per cwt. will continue generating payments each month from March through August. The 2018 Farm Bill also removes the previous restriction that prohibited producers from enrolling milk in both the MPP program and the Livestock Gross Margin for Dairy (LGM-Dairy) program during the same month. It further allows farmers previously prevented from enrollin g in MPP during 2018 due to this restriction to enroll retroactively in MPP and collect payments for 2018 for the months during which they were prevented from doing so. Farmers who purchased buy-up coverage under MPP during 2014-2017 are also eligible under the Farm Bill to receive a partial refund of their net payments during those years. 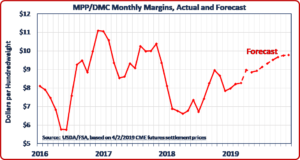 USDA’s DMC margin forecasts can be accessed online.